WattHead - Energy News and Commentary: A New Era of "Post-Partisan Power"? To accomplish this worthy goal, Congress will have to put aside the stale arguments that it settled into during the climate debate. Our representatives must realize that they are no longer talking about the merits of climate change or a cap system, but American jobs and innovation capacity. Today’s Thomas Friedman piece relates an anecdote about President Obama and Secretary of Energy Chu’s plan to create eight clean energy innovation hubs around the nation. The $200 million price tag for these research and deployment centers would reap untold benefits in advanced R&D, technological innovation, and regional employment, yet funding has been limited to three of the eight proposals. When Friedman told this to his guest Kishore Mahbubani, the dean of the Lee Kuan Yew School of Public Policy at the National University of Singapore, Mahbubani was baffled that they were discussing millions and not billions of dollars. Meanwhile, as America is squabbling over $200 million dollars, China is lavishing its clean energy sector with $738 billion over the next decade. The ashes of this summer’s climate change bill could provide rich soil for bi-partisan energy efforts. 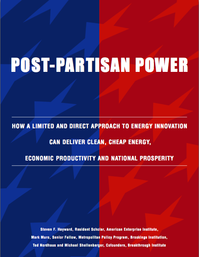 Building on "Post-Partisan Powers" work, Americans of all political persuasions should strive to identify how much they actually agree on in regards to the growth of the American economy and energy infrastructure.